ANDALUSIA, ALABAMA (March. 2013) – Turf Pride LLC announced it has completed its purchase of Trion Lifts Inc., the leading manufacturer of lift equipment designed for the maintenance of turf equipment. "The completion of the sale is a significant milestone in our company’s history. We enter this new phase of our growth and development with a product that has an excellent reputation in North America and many areas around the world," said Don Cotton, President of Turf Pride. "Trion has been moved to our location in Alabama, our day–to–day operations will remain the same, and our dedication to providing our customers with products enabling them to make their jobs more productive. We will invest in our growth as a company for the benefit of our customers and employees." By incorporating the Trion Lift into our existing product line, it will enable us to significantly reduce the manufacturing cost and be more competitive with other makes and models of lifts. "Trion Lift is the preeminent supplier of lift equipment designed for your mowers that ensures time-saving maintenance functions, reliable performance and vital mechanic safety," said John Beattie, President and Chief Executive Officer at Trion. "We are enthusiastic about the company’s sale to Turf Pride and look forward to the management team’s strategies for worldwide growth." Trion Lifts was located in Evans, Colorado and began manufacturing lifts in August 1991. Trion has numerous patent applications that were filed resulting in seven U.S. and foreign patents as well as a trademark assignment. These and subsequent patents filed apply to the original Model 1800 and all of its successors. In addition, Trion has also expanded its business to include a growing line of workstation accessories. 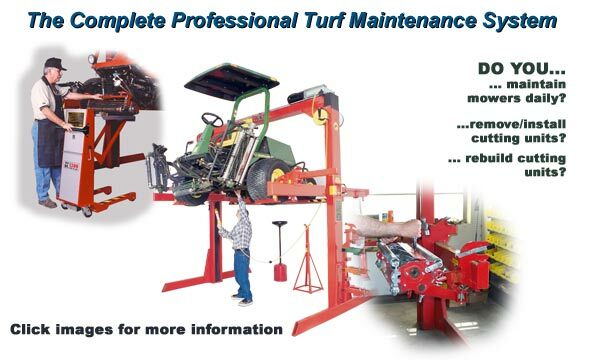 They add to Trion’s versatility and enhance its use as a complete turf maintenance workstation. Turf Pride LLC manufactures products for the turfgrass professional. Turf Pride strives for excellence and ingenuity, providing innovative designs and engineering for turf equipment. The products include a line of deep tine aerators, core collectors, reel and bedknife sharpeners, de-thatchers, large area spreaders, bedknives, rollers and replacement parts. For more information, visit www.turfprideusa.com. What is total confidence in your maintenance program worth to you? Lift equipment designed for your mowers ensures time-saving maintenance functions, reliable performance from your turf equipment and vital mechanic safety. Ramps, hoists and other lift equipment don't offer the speed of set-up for your routine maintenance tasks or the advanced passive safety features of a Trion system. Those who want the best for their turf maintenance programs buy Trion for simplicity, safety and confidence they can rely on. Find out what Trion Lift owners say about our systems!!! Copyright © 2003, Trion Lifts, Inc.